Gary Horstkorta contributed these photos by Norman Milne of the October 12, 1958 event. 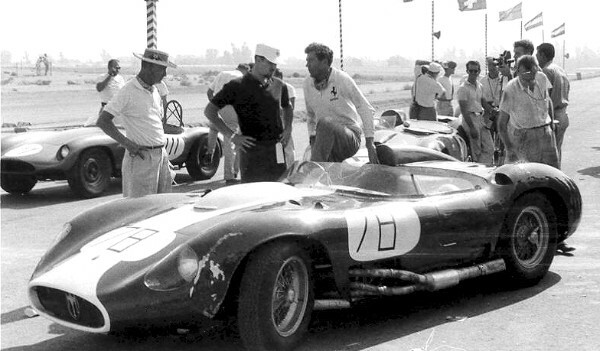 Carroll Shelby, in Ferrari shirt, stands by Temple Buell's Maserati 450S in the pit lane. It was a disappointing event for Shelby, he could qualify no better than 17th, and was out after only 4 laps in the main event. 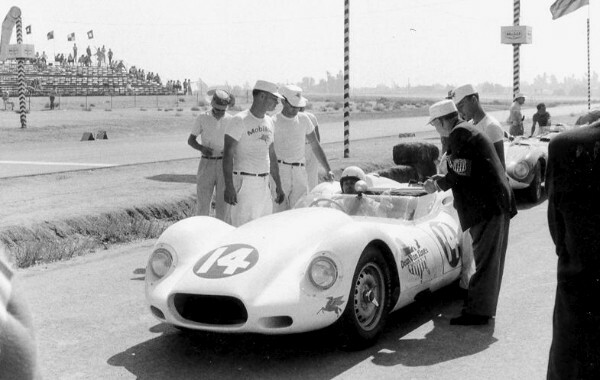 In the background are the #2 Ferrari 412MI driven by Phil Hill and Ak Miller's #111 "Oldsmobile Special". Is that Jo Bonnier talking with Shelby? Any I.D. 's on anyone else shown in this photo? "The Ak Miller Devin bodied special that ran the first L. A. Times GP was his first of four, possibly five, Devin bodied cars that he built and raced. 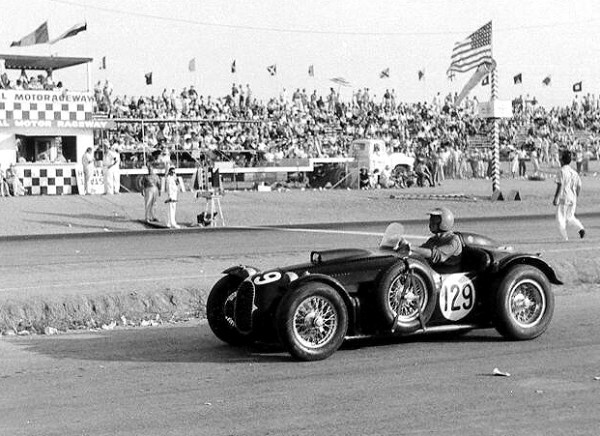 Car #111 was Chevrolet powered and used 1950 Ford IFS front suspension and some sort of Ford rear live axle. Ak built a simple tubular frame for the car. Bobby Unser was supposed to race the car but when it started to experience crankshaft bearing failure Ak decided to let Bobby drive El Caballo II (Kurtis chassis) in the big Sunday race. Ak did start the race in the Devin-Chevrolet just to see how far it would go and hopefully win some money. This is the car that Ak and Jerry Unser used in the motion picture "The Road Racers". HWM-Chevy driven by Ralph Ormsbee. He qualified 32nd and soldiered on to finsh 13th in the big race. This warhorse was originally driven by Bill Pollack; in the 1980s John Masterson continued its long and successful track career. Here's Bill Pollack himself in the Dean Van Lines-entered Lister-Chevy. He qualified 16th and finished 8th.